Sleeps 6+ This spacious complex is suitable for couples and families,with plenty to do in the local and surrounding area.The apartment is built to a high specification where families will enjoy the spacious poolside area where they can relax in the comfortable and safe surroundings the Complex has to offer. The apartment is on the 2 nd floor and is fully furnished with air con in the lounge and bedrooms. The town centre is approx 5-10 mins walk where there are an abundance of bars/restaurants and a large selection of shops, to suit all tastes, ,There is good night life for everyone with a variety of bars/clubs open until the early hours. There are buses (dolmus) in the area which run to all the local amenities and other towns and beaches locally. 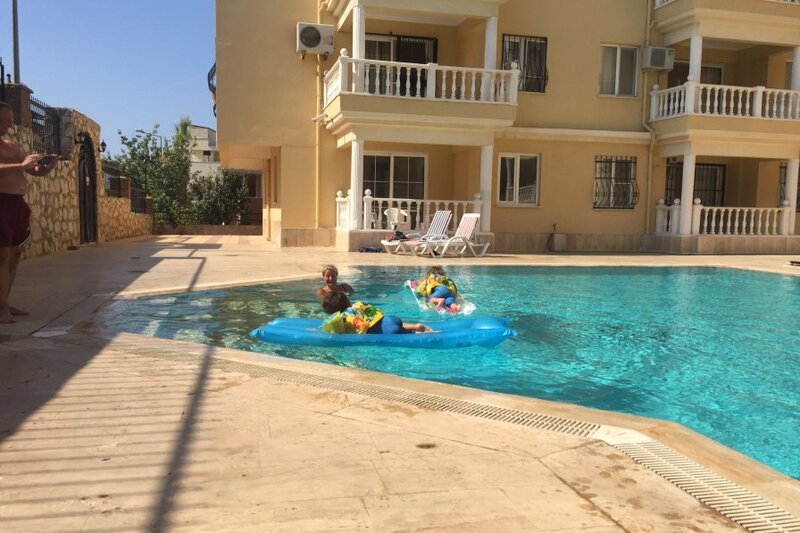 They can take you to the legendary Temple of Apollo and the Aqua Park and to the beautiful beaches at Akbuk. There are many restaurants that will pick you up from the apartments and back again free of charge if you eat in their restaurant! There is a small supermarket at the bottom of the road and bigger supermarkets a little further up the road. ATM’s are found in Dolphin Square (main town centre) .The currency is Turkish Lira, there are places with competitive exchange rates should you need to change your currency,although many places accept Euros and Sterling. Pamukkale, meaning "cotton castle" in Turkish, is a natural site of white rocks. I can help you with web sites for flights and airport transfers.